Tradition, charm and elegance on the plain. 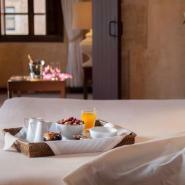 A natural setting of plains, centennial olive trees and stork nests, invite rest and surround the Hospes Palacio de Arenales & SPA, a five star boutique charming hotel situated in Cáceres. This hotel results from the rehabilitation of a small 17th century palace which was the Golfín noble family summer residence. The traditional architecture and whitewash of the building was conserved, but the interior was renovated in a functional and contemporary style, with touches of charming elegance. The rooms and suites are spacious and luminous, offer views over the garden and countryside, with a modern decoration which contrasts perfectly with the traditional lines of the palace. At the restaurant Las Corchuelas, you may appreciate the best cuisine from the Estremadura region, carefully prepared by the hotel's chef. A visit to the ample SPA is also recommended, which has an interior swimming pool and the latest health and beauty treatments for your body. Accept a welcome drink of cava to mark the start of a calm holiday rest and then venture out into the fantastic historical city centre of Cáceres, classified as World Heritage Site by UNESCO, which is just a few minutes from the hotel.